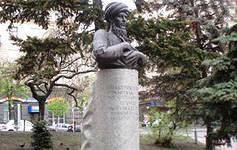 The 290th anniversary of the great Turkmen poet and thinker Mahtumkuli will be celebrated in 2014 in Turkmenistan. His deep human feelings, expressed in poetic form tell about accurate representation of contemporary conditions and characteristics of the people living in the XVIII century and their exploits for in the struggle for their right to life and a happy future. Through the creative legacy of Mahtumkuli we realize cultural connection, ideological continuity of generations from different historical periods, national identity and integrity. Mahtumkuli poetic heritage is a big, bright, original contribution of Turkmen people to the world culture. This legacy is not only the pride of Turkmen people but also people around the world. This significant celebration will be attended not only by compatriots but also foreign visitors, admirers of the great poet. One of the greatest works of Mahtumkuli is the fact that he was the first founder in literature of Turkmen language, enriching it with images of folk art and the best traditions of Eastern poetry.